Tom Head from The South African asks the question if anyone has caught election fever yet? 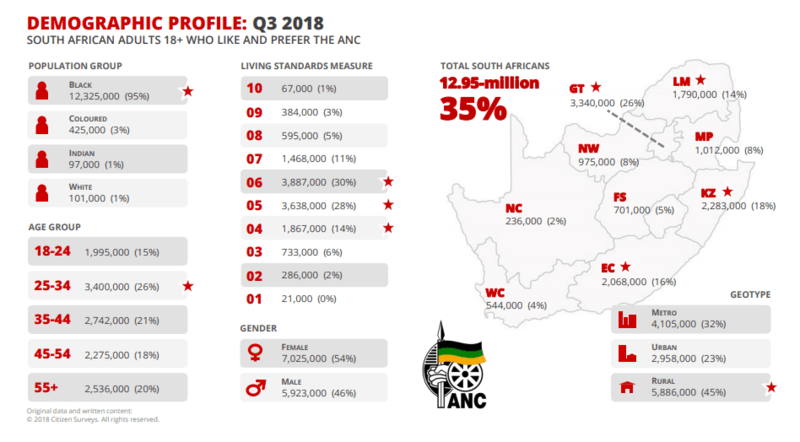 This article is a “Citizen Surveys Guide” to all things ANC, DA and EFF. 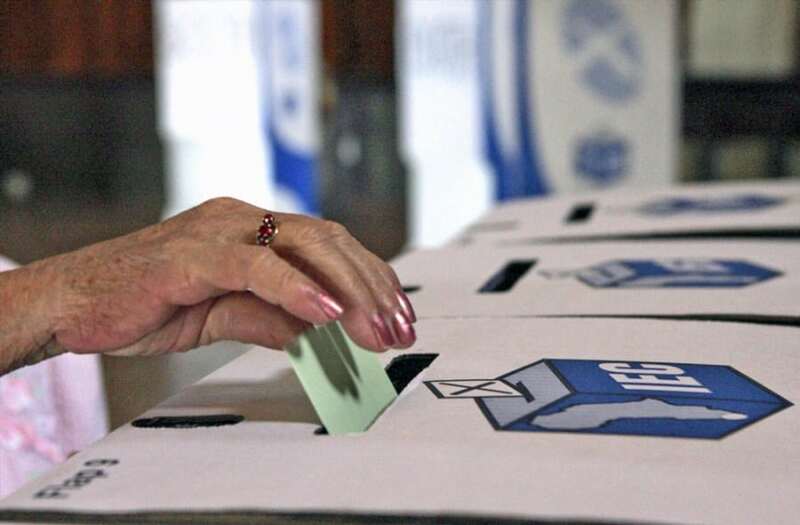 With the 2019 Elections nearing – possibly before next May – the interest over where each party’s support is going to come from begins to intensify. Thanks to Citizen Surveys, we’re able to lift the lid on who is most likely to back the ANC, the DA and the EFF at the ballot boxes. There are plenty of surprises in the mix, but we’ve also got some “predictable” results too. The survey involves 3 900 respondents for all quarterly interviews. Sample sites are randomly chosen across every province and metro as well as in many rural locations. Their responses aren’t stone-cold guarantees of who they would vote for, but it does indicate who participants are showing their support towards. So let’s get into some number crunching, shall we? Citizen Surveys: Where is each major party getting its support from? The ANC gets the majority of their support from rural areas – in fact, 5.8 million citizens in this demographic support the party – Which is 45% of their total backing. Out of all three major parties, the ANC is the only organisation preferred by more women than men. A total of 7 025 000 females are estimated to support the ruling party, which is 54% of their projected vote share. The party have their most solid support from 25-34-year-olds – otherwise known as traditional millennials. An estimated 3.4 million in that age group look favourably upon Cyril Ramaphosa’s government. There’s been a drop in support of just over 1-million Black adults, mainly poor, within the extended 25-49 age group though. Support declined in the Metro areas, with the largest drop occurring in Gauteng. The DA is the only party surveyed whose majority support base is coloured. There are 907 000 coloured citizens predicted to support the DA for the 2019 Elections, which is 35% of their total backers. The opposition enjoys a more equal spread of support, with an even distribution amongst black (33%) and white (28%) South Africans. Their strength in diversity is still a little top-heavy with seniors, however. The DA is the party most reliant on citizens aged 55 and over, with 26% of their supporters being classed as “elders”. 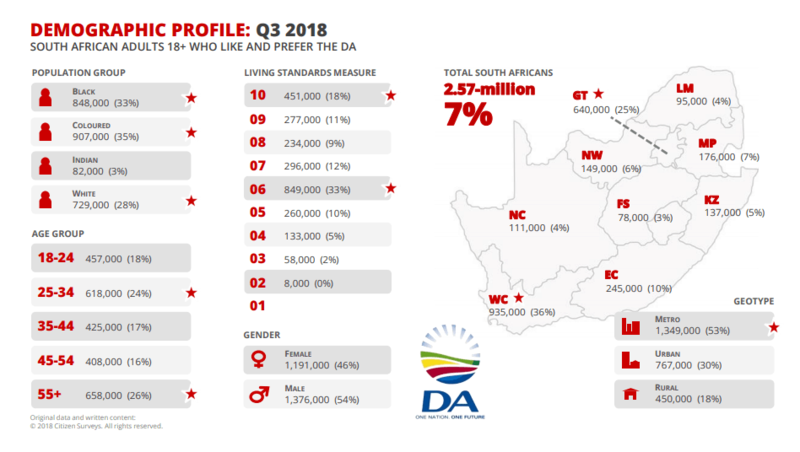 People who score a 10/10 on the living standards list – so essentially, rich people – are most likely to vote for the DA. Around 451 000 voters in the top 10% of earners are projected to support Mmusi Maimane and co. Meanwhile, it’s forecast that 2.6 million adults feel close to the DA, as the party also benefits from an anti-ANC and an anti-EFF vote. This generally boosts its performance at the polls. If you’ve ever wondered how many white South Africans support the EFF, Citizen Surveys has got a number in mind: Their poll estimates that there are about 11 000 white supporters of the red berets. If we look at locations, then it’s obvious that the EFF need to perform well in Gauteng. With 43% of their support said to live in the province, that translates to a potential vote share of 1.1 million. As Julius Malema and his chargers are the most vociferous party on free education and land expropriation, his left-wing policies have found a home with our youngest voters. The EFF is the most reliant of all the big three on the youth vote – 31% of their support base is aged between 18-24. 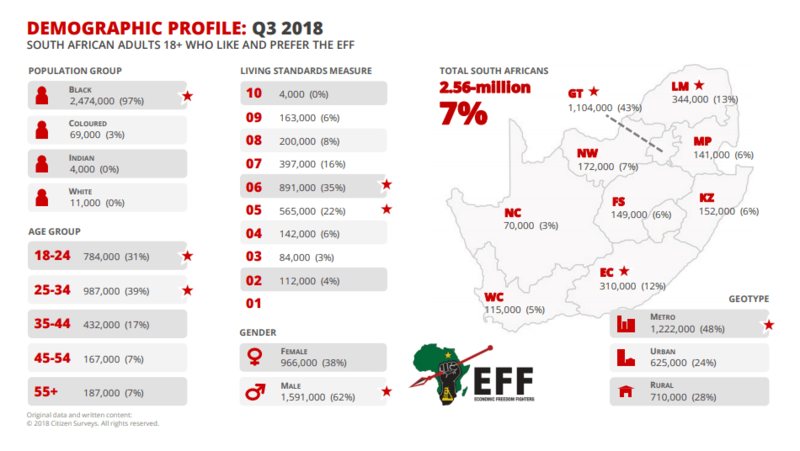 Their popularity is generally improving, too: The proportion of South African adults who “feel close” to the EFF increased from 5% (2 million adults) in Q2 of 2018 to 7% (2.6 million adults) in this current quarter.